Cryoglobulinaemia was the diagnosis in this case. Cryoglobulins are serum immunoglobulins complexed with other immunoglobulins or proteins that reversibly precipitate in cold temperatures. They can be monoclonal or polyclonal in origin. There are three subtypes which have slightly different patterns of presentation and are associated with various malignancies (Waldentroms, Myeloma, CLL, other NHL), autoimmune disorders (SLE, rheumatoid arthritis) and chronic infections (such as hepatitis B, hepatitis C, HIV, and Epstein-Barr virus). Hepatitis C is particularly strongly associated with cryoglobulinaemia. The most typical clinical presentation is the appearance of purpura; and presentation is related to hyperviscosity and/or thrombosis. The severity of the symptoms reflects the serum concentration and the temperature at which cryoglobulins precipitate. However cryoglobulins do not lead to haemolysis, unlike the conditions outlined below. A warm sample must be taken to the lab, where it is cooled in controlled conditions and the cryoprecipitate is removed and then analysed by immunofixation in warm conditions. Treatment is of the underlying disorder, be it haematological or infective. Plasmapharesis and rituximab have been reported as being effective. Otherwise patients must be advised to keep warm to avoid developing necrosis. Paroxysmal Cold Haemoglobinuria – a rare, usually transient, condition affecting children triggered by infection. Characterised by the Donath Landsteiner antibody – a whole new topic to be covered another time! Cold haemagglutinin Disease – this is a condition, most commonly associated with CLL and other B lymphoproliferative disorders, is characterised by a monoclonal antibody that causes red cells to agglutinate at room temperature. 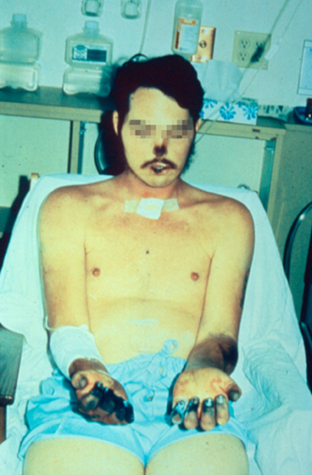 Patients may develop similar issues as seen in cryoglobulinaemia, ie cold induced cyanosis of extremities (although not necrosis) because microvascular flow is impaired as red cells agglutinate in the cool vessels. This condition results in very abnormal lab results, as explained below. These patients need a sample to be kept warm prior to analysis. The antibody also stimulates the complement system leading to chronic intravascular haemolysis. Activated agglutinins = RBC aggregation in vitro at room temperature. MCHC is a calculation derived from measured indices (the Hb divided by packed cell volume). If RBC’s are aggregated the automated count and MCV measurement are erroneous. Cold agglutinins can cause a falsely elevated MCH with most haematology analyzers. Therefore MCHC calculation is invalid/falsely elevated. EDTA anticoagulated blood is routinely analyzed at room temperature. If specimen is prewarmed the MCHC will return to normal because agglutination is reversed. (Need analyzer with short sample path). The lab shouldn’t report elevated result in this case, abnormal MCHC is really used for troubleshooting specimen results internally only. This entry was posted in Anaemia, Myeloma/paraproteins, Related to other specialities and tagged cold haemagglutinin disease, cryoglobulinaemia, Paroxysmal cold haemoglobinuria. Bookmark the permalink.